The history of the Church of the East, which over many centuries comprised the major portion of Christianity, remained until recently almost unknown to the West, except for occasional accounts, such as that of Marco Polo, who traversed Asia in search of adventure and wealth. This was primarily due to the complete isolation which existed between the two branches of Christianity, Eastern and Western, both of which originated in the same source, namely, the Aramaic, a language of the Semitic group. Inevitable historic and geographical reasons were partly to blame for this isolation. But the most in important factor in the total ignorance of Western Christianity as to the history and accomplishments of this Church of Asia, was the cruel and selfish policy adopted toward it by the Roman-Byzantine emperors and their successors, whose imperialist religion the Church of the East refused to follow, and who therefore branded it with the misnomer “Nestorian.‘’ This, together with the eclipse prevailing over Europe during the Dark and Middle Ages, completed the picture of separation. It is only during the last century or so, especially in this generation through the writings of various Protestant missionaries, travellers and secular historians, that the West has finally become aware of the existence of the Church of Asia. Arnold J. Toynbee, in his outstanding work, “The History of Civilization,” has shed further light on the amazing achievements of the Church of the East, not only because of its missionary enterprise and great contributions in the scientific field, but especially as the bearer of the torch of the Syriac civilization, and champion against the Hellenistic onslaught. That torch, which the oppressed and persecuted Church of the East was unable to bear any longer, with the rise of Mohammed was taken over by Islam and carried on to a victorious end with the final expulsion of Hellenistic influence from the Middle East. Thus, in this special field, where the Church of the East had failed, because of its lack of political support, Islam had succeeded. Nevertheless, it is one of the mysteries of the Divine Providence that the descendants of the heathen Assyrians, from whom the Greeks Largely borrowed their civilization and culture, would now as Christians stand in the gap against Hellenistic cultural encroachment. The beginning of the Church of the East is coincident with the earthly ministry of our Lord. King Abgar, sovereign of the little state of Oshroene, with its capital known as Orhai or Edessa, in the northwest of Mesopotamia, believed in Christ and His mission. The Assyrian people, therefore, speaking the Aramaic language (the language spoken by Jesus and His apostles, and in which the New Testament and parts of the Old Testament were written), can rightly claim the honour of being immediately next to the small band of Galileans as followers of our Lord, in their conversion to the “Haymanutha Mshikhayta,” the faith of the Anointed One. This common bond, and the exchange of ideas, traditions and customs between the ancient Assyrians and the Hebrews, enabled the Assyrians to accept and appreciate the Christian Faith in a manner that was not possible by non-Aramaic speaking peoples. Because of this, the unequalled zeal and missionary expansion this Church of Asia, which to this day has preserved in its purity the Apostolic Faith and traditions of the early Church, can be readily under stood. The Church of the East, as this branch of Aramaic speaking Christianity came to be known, was officially founded by the Apostles, Mar Patros (St. Peter), Mar Toma (St. Thomas), Mar Addai (St. Thaddeus) and Mar Mari of the seventy disciples. St. Thaddeus was sent by St. Thomas to the City of Edessa immediately after the resurrection, thereby fulfilling the promise made to King Abgar by our Lord himself. The City of Arbil (Erbella) in Assyria also shares the glory with Edessa as the starting point of Eastern Christianity. Among its early Patriarchs, three of them were related to Mart Maryam (The Lady Mary) the Holy Virgin, and Mar Yosip (St. Joseph), her righteous spouse. It was the Church within the Persian Empire and therefore remained unaffected by the many theological disputes, schisms and heresies that in later centuries arose within the imperial Christianity of the Roman Empire, and which, for the most part, were dictated by personal ambitions and animosities among the various prelates and unceasing struggle for power between the Latin and Greek Churches. Similar charters of protection were given from time to time by the Khalifs to the Church of the East. The persecutions which did occur were in fact for the most part caused by the political ambitions of Constantine and his successors, and the later by the various Crusaders, who in the name of the Cross of Christ, carved out their ambitious territorial expansions and plundered the Middle East. At the same time a covetous eye was constantly directed at the great Christian Church of the East, and no means was spared by these Roman Emperors and their successors to agitate the heathen and the Islamic rulers against its followers. The purity of the Apostolic Faith of this most ancient Church can be seen throughout the prayers and praises of its worship, which express the theological point of view of the Church. Little is known of the fact that all the fathers of the Latin Church of the first and second centuries, such as Tatian Yostino (Justin Martyr), Organon (Origen). Melito, lrenaeus, and others who followed St. Paul the apostle to Rome, were all Assyrians or Syrians, Aramaic speaking people, missionaries of the Catholic Church of the East. Individual Assyrians started coming to the United States of America some time during the middle of the Eighteenth century, but it was only after the First World War that they began coming in as immigrants. The tragedies and untold sufferings that forced them out of their homes of origin in the Middle East, in Kurdistan and Iran, have already passed into history, and is therefore neither necessary or appropriate to deal with these events and the causes lying behind them here. Today, many thousand Assyrians live as happy and contented citizens of the United States of America. A considerable number of these Assyrians on their arrival in this country identified themselves with their respective co-­religionists, and they are already on the way to being absorbed into these larger bodies. These Assyrians were the fruits of missions, which, during the past four centuries, proselytized in India and the Middle East. The Roman Catholic, the Russian Orthodox and the Presbyterians were the most prominent of these missions, the latter two working chiefly among the Assyrians of Iran. The Church of the East on the other hand had no counter part in this country. Assyrians therefore, who were its members, had to depend completely upon such means as they themselves could provide, in order to maintain their Church in a country, and amid circumstances, totally alien to them. The insufficient number of priests and deacons available maintained the services of the Church of the East to the best of their ability. Services were conducted in private homes, basements, or churches hired for special occasions. In some instances the Protestant Episcopal Church occasionally allowed them the use of its edifices, a gracious act which has been much appreciated. The situation in the United States was rendered more difficult because the Mother Church in the Middle East had been uprooted from its centuries old home and made destitute as a result of World War I, so that it was not possible to meet even the meagre needs of this new struggling branch of the Holy Church. 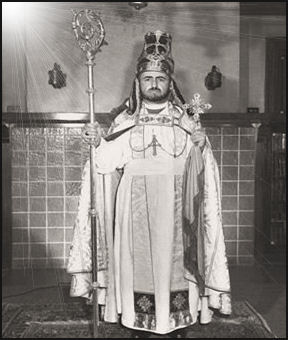 Except for a short visit of one of the Bishops of the Church, and a second by the Metropolitan of India, who was delegated by the Patriarch to visit the Church of the East in the United States, the Church existed without any episcopal supervision, and the seriousness of this fact, for a Church whose foundation is based upon Apostolic succession and close episcopal supervision, cannot be overestimated. This was the situation on the Patriarch’s arrival in this country in the year 1940. Since then, several priests and deacons have been ordained, new churches built, properties purchased for the use of the various parishes, and a competent administration established. Within the last few years a totally non-Assyrian, English speaking parish has been founded in Seattle, Washington, the first such in the history of the Church of the East. Even more recently a small number of these new members of the Church have founded a monastic order, and are in the process of establishing a monastery for the Church of the East in this country.